In the previous post we looked at message filtering using message headers in RabbitMq. The Headers exchange pattern is very similar to Topics we saw in this post. The sender sends a message of type Headers to RabbitMq. The message is routed based on the header values. All queues with a matching key will receive the message. We can specify more than one header and a rule that says if all headers or just one of them must match. The headers come in key-value pairs such as “category:vehicle”, “type:car”. Headers allow us to fine-tune our routing rules to a great extent. In this post we’ll look at one more message exchange pattern called scatter/gather. It is similar to two-way messaging but the publisher will get the responses from multiple consumers. This pattern is similar to the RPC message exchange pattern in that the sender will be expecting a response from the receiver. The main difference is that in this scenario the sender can collect a range of responses from various receivers. The sender will set up a temporary response queue where the receivers can send their responses. It’s possible to implement this pattern using any exchange type: fanout, direct, headers and topic depending on how you’ve set up the exchange/queue binding. 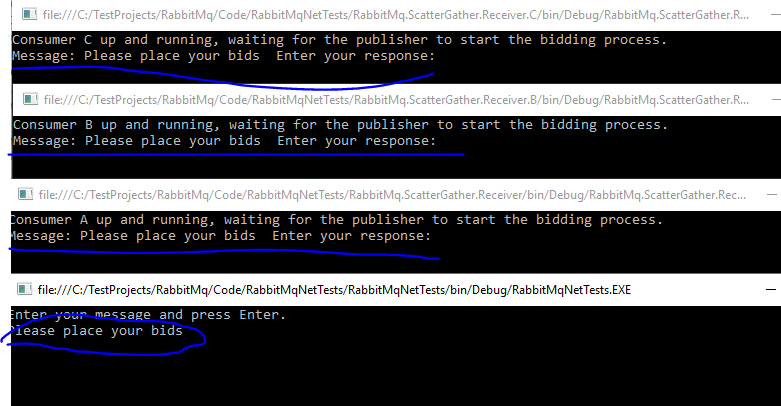 In other words there is no specific exchange type in RabbitMq that specifically corresponds to scatter/gather, we have to do some extra coding ourselves. You can also specify a routing key in the binding like we saw before. I think this is definitely a pattern which can be widely used in real applications out there that require 2 way communication with more than a single consumer. Consider that you send out a request to construction companies asking for a price offer. The companies can then respond using the message broker through the temporary response queue. We’ll re-use several ideas and bits of code from the RPC pattern so make sure you understand the basics of that MEP as well. We’ll be working in the same demo .NET console application as before. We also declare a fanout exchange called “mycompany.exchanges.scattergather” and then bind each queue to it. Much of the SendScatterGatherMessages function looks familiar from the discussion on the RPC MEP. However, there are some key differences. The function allows us to specify a minimum amount of responses we’re willing to wait for. In our example this number is 3. We want to collect the responses in the “responses” string list. We build a temporary response queue using the QueueDeclare().QueueName property. Then we publish our first message to the mycompany.exchanges.scattergather exchange and wait for the responses in the implemented Received event handler of scatterGatherEventingBasicConsumer. We simply print the response and add it to the list of responses. If the minimum number of responses has been reached then we close the channel and the connection. The only new thing here is that we close the channel and the connection as soon as the receiver has responded. This will also close the execution of the console application, i.e. the console windows will close down immediately. In other words we only let the consumer place a single bid. Otherwise the code is the same as above. At this point the publisher’s window hasn’t closed down due to the Console.ReadKey() in the Main method. Otherwise the channel and connection to RabbitMq have been terminated. 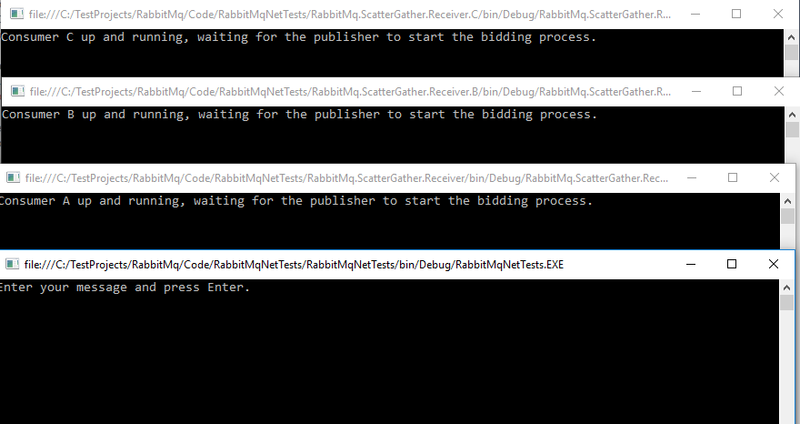 This was a basic implementation of the scatter/gather message exchange pattern in RabbitMq. The next post will wrap up the RabbitMq basics series with some remaining topics.